Missions! This is the heartbeat of God. …..And he said unto them, Go ye into all the world, and preach the gospel to every creature.He that believeth and is baptized shall be saved; but he that believeth not shall be damned (Mark 16:15-16). This is God’s commandment to us as believers, how, then, can they call on the one they have not believed in? And how can they believe in the one of whom they have not heard? And how can they hear without someone preaching to them? Rom 10:14. If you cannot go to do missions like the missionaries, you can give to support them, you can also fast and pray for them. God has called us as believers to give, fast and pray. This can also be your art of worship to Him, giving all that you have to support the work of His kingdom, giving to the poor and those in need. ….for I was hungry and you gave me food, I was thirsty and you gave me something to drink, I was a stranger and you welcomed me, I was naked and you gave me clothing, I was sick and you took care of me, I was in prison and you visited me.Then the righteous will answer him, ‘Lord, when was it that we saw you hungry and gave you food, or thirsty and gave you something to drink? And when was it that we saw you a stranger and welcomed you, or naked and gave you clothing? And when was it that we saw you sick or in prison and visited you?’ And the king will answer them, ‘Truly I tell you, just as you did it to one of the least of these who are members of my family, you did it to me (Matt 25:35-40). When you give to missions You are giving to the Lord and you will never miss or loose your reward. I encourage you to give and support missions and missionaries. There’s so much to learn from the life of Moses and his calling to deliver the Israelites from Egypt. He thought of himself as inadequate, incapable, not fit for the task but God made him to know that all he needed was obedience and confidence to accomplish the task. What do you have in your hands? 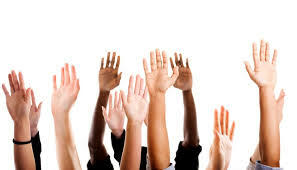 Everyone has “a rod” in his or hand, something that can be used to help others, and be a blessing to them. Your talents, your skills, the gifts that God has blessed you with but some of us are holding back just like Moses did. We think we are too young, we think we can’t do it, we think we are just too shy to do what God has called us to do. God is waiting on us, He is waiting on you to give him that rod in your hands so He can turn it to miracles and use it to be a blessing to someone. However, we need to work on ourselves to be able to accomplish or do whatever God has called us to do. As believers and music ministers, we need the help of God to handle our weaknesses, giving them to God to help us overcome them so that these weaknesses will not hinder us from fulfilling our destiny. What are those weaknesses? The bible calls them “the flesh” – anger, unforgiveness, lies,hatred, laziness,resentments,etc think of it, whatever can limit the grace and the anointing of God in a man’s life. Those things should be handed over to God so that they don’t destroy us. Moses weakness was anger and it cost him the Promised Land. Ask God to help you to overcome those weaknesses, you know what they are and God knows too. He made you and you are the sheep of his pasture. You can not even hide those things from Him, then why don’t you admit them and ask Him for more grace and make a conscious effort to work on yourself too so that God can turn that rod or those rods in your hands to miracles – fiscoyadahpraise! ” If you will trust Him by taking care of the “small end” (the little things ) He has instructed you to do, He can and will use you to do great things for His glory” – Jentezen Franklin. God was about to give Moses an assignment to deliver the Israelites out of Egypt but he was in doubt, he thought he could not do it. When he began to question God’s plan, God asked him what was in his hands…Moses replied, “a rod”. God transformed the rod into a serpent and from that point God used Moses’ rod to perform miracles. Then the Lord said, “Put your hand inside your bosom.” So Moses put his hand into his bosom, and when he took it out, the skin was leprous—it had become as white as snow. Now put it back into your bosom, He said. So Moses put his hand back into his bosom, and when he took it out, it was restored, like the rest of his flesh. He must be able to handle the snake and He must learn how to handle the flesh. The snake represents the devil and God is saying we must learn how to handle the enemy, when the enemy comes at you, God says give it over to Him and He will do the rest. God told Moses to pick up the snake by its tail (the small end). If you will take care of the “small end” God will take care of the “big end”. God wants a partnership with you. The flesh can rob us of the anointing. If we cannot handle our own flesh, we will never be able to help others.When Moses killed the Egyptian to protect his people, he gave in to the desires of the flesh. He was eventually discovered, your acts of the flesh will always be uncovered. You must learn how to take hold of your fleshly desires and give them over to God. Moses lost his temper and smote the rock with the rod that God had anointed and he got himself into trouble again. We should be careful of how we use the gift,talent and the authority that God has given us. If you give in to the flesh, no matter what your position, it will cost you. Moses gave in to the flesh through disobedience and God did not allow him to enter the Promised Land. Culled from: when little things get in BIG HANDS by Jentezen Franklin. Please, remember Darlene in your prayers , this is an update from her. Well friends, it’s the first day of autumn in OZ. It’s rainy, overcast and absolutely lovely. I can hear the ocean, thrashing about, from my bedroom window and it is purely good tonic for my soul. I head into my third round of chemo on Monday. Praise God I have reached my halfway point. This entire journey has truly been a mind game. Keeping my MIND focused on all God says, instead of how I am feeling, which is becoming a little fragile at times. In this, I keep going to my book of promises that I have been writing in. In this book are my list of scriptures that I absorb like a daily tonic. It is in this space that I find rest. During this whole process, I have received so many great encouraging letters and emails from those who have walked through the fire and come out smelling smoke free at the other end. I cannot begin to express how this fuels my soul for the days ahead. I would like to say a HUGE Thank You to my friends around the planet and at home who are SO DAILY in and on this journey with me. Psalm 91:15-16 – He shall call upon Me, and I will answer him; I will be with him in trouble; I will deliver him and honor him. With long life I will satisfy him and show him My salvation. 2 Timothy 1:7 – For God has not given me a spirit of fear, but of power and of love and of a sound mind. 1 John 4:4 – You are of God, little children, and have overcome them, because He who is in you is greater than he who is in the world. Romans 8:37 – Yet in all these things we are more than conquerors through Him who loved us. Phillipians 4:13 – I can do all things through Christ who strengthens me. Isaiah 59:19 – When the enemy comes in like a flood, the spirit of the Lord will lift up a standard against him. Luke 1 :37 – For with God nothing is ever impossible and no word from God shall be without power or impossible of fulfillment. Again and again, God’s word trumps our adversities. It’s His nature to heal and to rescue. Never forget that. 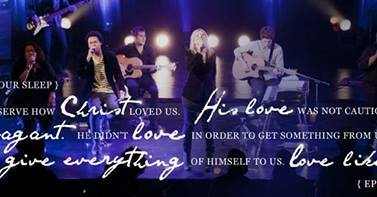 It’s all based on His great love for us – not on anything we have done. This week, my dear friend, Liz Clout, taught at our women’s gathering. She spoke about it is no longer ‘I ‘that lives, but Christ who lives in me. Once we are saved, ‘I’ no longer exists, but rather, life is done in the plural and understanding the reality of Jesus always being with us. It was SUCH a great message. Thanks Lizzie!!! Also in this season, I am very aware that my suffering is small compared to what many are suffering on the earth. The answer to it all has got to be Jesus led. Open hearts in prayer, open hands in service, open ears to the Holy Spirit, and open doors to all who need comfort. So.. with much love in my heart I sign off for a couple of weeks. We will chat again soon.. 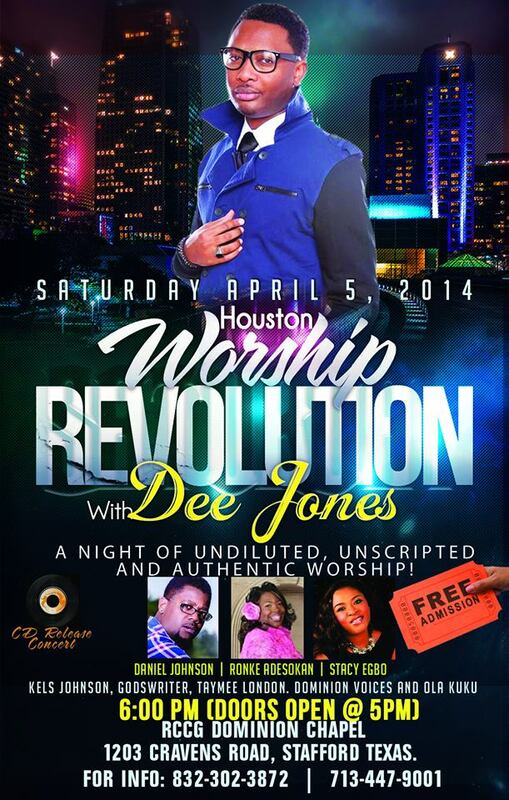 Greater things are yet to come..
Houston Worship Revolution with Dee Jones and other worship leaders will be coming up ON 5TH of April,2014 at Stafford Texas. It promises to be a wonderful worship experience. Save the date and plan to be there. Daniel Dee’ Jones is an International Worship Leader, Producer/Recording artist/ Singer Song Writer/ Music Director with a difference. 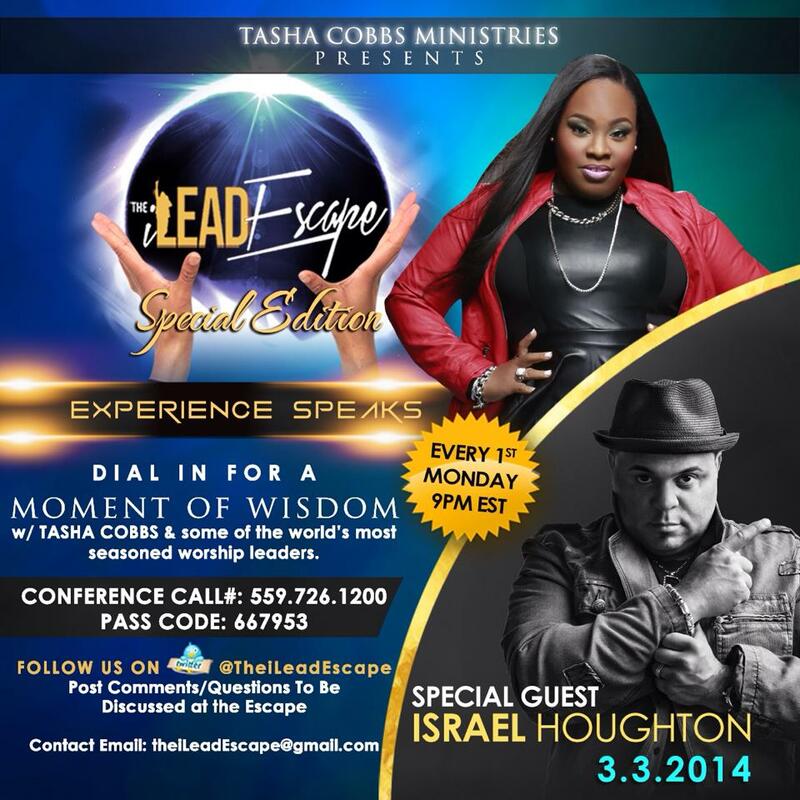 He recently released his anointed sophomore album “Worship Revolution” and is set to go on a world tour. Dee Jones believes it’s time to get back to the heart of worship and be part of the worship revolution God has started. Enjoy this song by Dee Jones.